Siril Varma, former junior World No. 1 and Ashmita Chaliha entered the Asian Games selection mix after clinching their respective titles in Men’s Singles and Women’s Singles events at the All India Senior Ranking Badminton Tournament, Hyderabad on Sunday. The champions defeated tournament favourites, Sourabh Varma and Sai Uttejitha Rao in the summit clash at the Pullela Gopichand Badminton Academy with 18-21, 21-16, 21-8 and 21-16, 14-21, 21-15 in the 50-minute contests. After losing the first game, Siril geared up to save the second game and pushed the match to the decider. By the time the third game started, weary Sourabh - winner at the All India Senior Rankings Tournament, Bangalore - couldn’t keep up the stride as this was his 20th match since last two weeks. It was perfect time for Siril to thrash Sourabh with 21-8 and enter the Asian Games. However, Sourabh’s finesse took him in the pole position to book the last spot in the Indian contingent list, after Asian Games squad, following the veterans Kidambi Srikanth, HS Prannoy, Sai Praneeth and Sameer Varma. Yet, uncertain as Lakshya Sen and Siril are in the combat for the last spot. While Uttejitha, the winner in Bangalore lost fighting the pinnacle game against the southpaw Ashmitha. In the opening round, Ashmitha fought back from a 8-11 trail. The third seeded Uttejitha rebounded in the second game to take a slender lead with 7-1 and went down the wire to save the game. The third game saw Uttejitha took a 10-6 lead early on. However, Ashmita claimed the next six points and then, run away with the match and the title. As Uttejitha was slowly picking up and being prone to few unforced errors, Ashmitha took the advantage which costed the former the first game. Anyway, both the shuttlers book the spot in the Asian Games squad with three spots available in the Women’s Singles category. 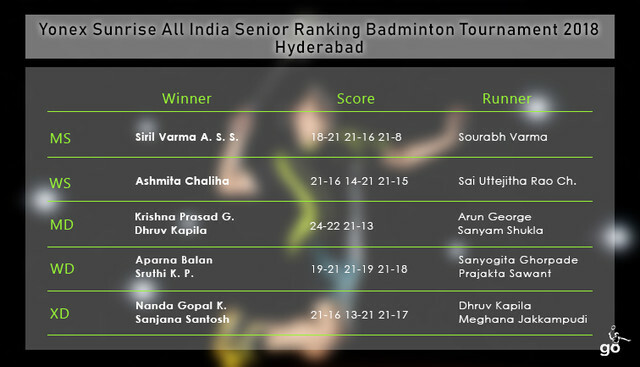 The third spot is the battle among Rituparna Das, Vaishnavi Jakka Reddy and Gayatri Gopichand. In the doubles events, the third seeds Aparna Balan and Sruthi KP, of Women’s Doubles, fought hard against Sanyogita Ghorpade and Prajakta Sawant to win with 19-21, 21-19, 21-18 in the 63-minute contest. The selection committee of the Asian Games will have to pick between Aparna/Sruthi and Rutaparna Panda/Arathi Sunil, the winners at Bangalore. In the Men’s Doubles event, the top seeds Arun George and Sanyam Shukla lost to the unseeds Krishna Prasad Garaga and Dhruv Kapila with 22-24, 13-21.While in mixed doubles, K Nandagopal and Sanjana Santosh won the title, beating Dhruv Kapila and Meghana Jakkampudi 21-16, 13-21, 21-17 in the final. Regardless, there is no spot available for men’s doubles and mixed doubles in India’s squad for the Asian Games.